I new to the sight so I thought I would post for the first time... I justed picked this up 3 weeks ago for $500... and still stripping / cleaning it. 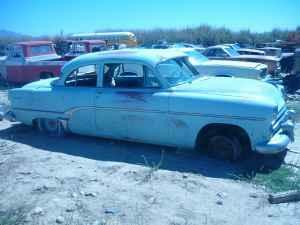 Heres a few pics of where I found the 54. The P.O. said he had it sitting there for at least 20 years. The license plate had a sticker from 1971!!! 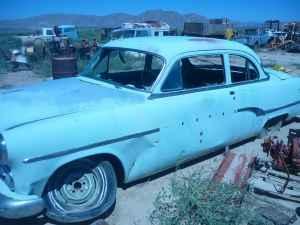 If I'm correct the 54 came with a straight six and optional v8. 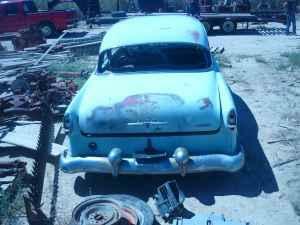 My question is the car was orginally a 230 flathead (which I do not have) and would like to put a 360 in it. Are the frame the same on the 6 and the V8? Looks to be a nice starting point, project. I think the frames were the same but I am not sure. The engines then had the mount in the front and not on the sides. I think the only difference may have been the crossmember at the front of the engine. 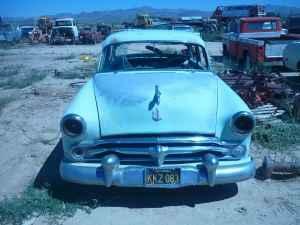 Or does anyone have a pic of a 1953 /1954 coronet with a V8 engine mounting? Specifically where the crossmember mounts? Welcome to the site. Looks like a nice car. Thanks... I put posting in the car builds tread, if you want to check on progress of the car. I really like the qoute "Beer is living proof that God loves us and wants us to be happy" Thats GREAT!!! LOL! Thats because its true! I'm going from memory, so take my info with a grain of salt. If you install a later model drive train, you will have to fabricate a crossmember and a rear transmission mount. Cars from that era had the biscuit rear mounts on the engine, so the crossmember was just behind the firewall, and there never was a factory one that supported the transmission. The front mount brackets will also have to be fabricated so you can use later model mounts. One of the fellows in our local club has a super nice 54' Dodge with the little 241 Hemi. All original for the most part. If you need something specific for reference let me know and I'll try to get pictures for you. No that's great... I'm looking for any info I might have over looked. The front mounts I know and was planning on making a crossmember. Now on the transmission mount I might have over looked so far... I'm still brain storming this creation in my mind : ) Any ideas on how I could do the trans bracket? You might look at a bolt-in crossmember like they used on the older Dodge trucks. That's what I plan on using on my '56. It's a little bit shorter than the width of the frame, so I'll have to weld some brackets on the frame to attach it to. However, that will be far easier than trying to make the entire crossmember, and I'll be able to use a commonly available truck transmission mount. Trans x-member like in my 79 100 4x4 might be just what ya need for the trans, if the bolt spacing on your tailhousing on your 727/904 is the same (should be), New mount bushings are easily had and less than $25 anywhere including bolts nutz and bolt sleeves. Oh yeah, almost forgot, I also have a trans x-member still under my parts truck, 84 Dodge d150 half ton 2wd 318 2v 727 trans. If ya think it will work, pay fedex or UPS and you can have it, I'll never have any use for it. Good info. THANKS!! What year are you planning to get it from? Thats very good info!! And it's very cool of you to offer it to me. Give me a few days to look into it and I might just take you up on it. I've been busy working on the 54 and when I'm not, The wifes on the computer selling ebay. So I haven't had time to post anything.To get you updated I had a "Paul's glass" come out and safely remove my window trim. He had some info that I was surprised to hear about... He said he had a connection to see how my of these cars were made and how many are left. He said there was 11,000 made in 54 (straight six and v8). And that 3,501 were a 2 door, and that there are only 158 left. I'm guessing that are registered... I dont know if it's true but he seemed believeable. Last edited by 1954 in progress; 09-11-2011, 03:34 PM. Just for information: Rustyhope a guy on internet sells kits to put disc brakes on your org. spindles(If you use them) theres also companys like ECI. (There are others also) Rustyhope saves you money by selling you the spacers and caliper bracket and gives you a list of part numbers you can pick up at a parts store. Check out both ways to see which way you want to go. In my opinion the suspention on these mopars was good just bad brakes. Good Luck with your car! !